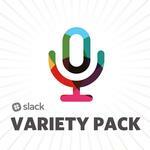 Slack Variety Pack is a podcast about work, life, and everything in between. It is a mix of original stories, funny office culture sketches, and journalism focused on innovation, modern culture, and people who have found their purpose. Think of it as 'This American Life' meets 'Office Space' meets 'Monty Python's Flying Circus'. Welcome to the first episode of the Slack Variety Pack, a podcast brought to you by Slack. This is a show about work, life, and everything in-between. In this episode, we go inside a $10 million quantum computer, talk productivity with BJ Novak at an NHL game, meet up with a Mars One candidate, hear about an epic fist fight in an office, and invent Audio Emojis.